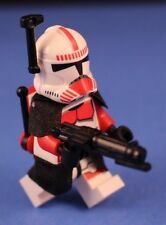 LEGO® STAR WARS™ 75046 Deluxe RED CLONE SHOCK TROOPER™ Commander + Armor & More! These custom blasters are modeled on the original weapons used by the clones in the Clone Wars. Custom Black Armor - cloth shoulder pauldron and leg armor. Expand your STAR WARS LEGO forces and may the force be with you! 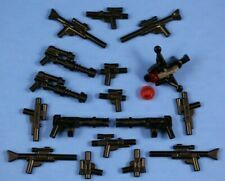 17 Official LEGO Assorted Rifles / blasters. 4 Standard short barrel blasters. 4 DC-17 Small Blasters. Outfit an army or replace lost blasters. 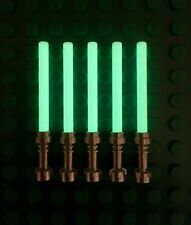 INCLUDES 17 weapons as pictured (24 official LEGO pieces): Build your Star Wars LEGO army with these great Official LEGO Accessories! Lego Star Wars Captain Rex Minifigure (75012) RARE!!! 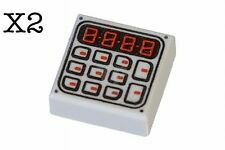 (2) 100% Lego Light Bluish Gray Tile 1x1 with Keypad Pattern. This fits on door knobs also. Easy to do and no asking for an invoice. These custom blasters are made from durable abs plastic for fun to add realism to your Star Wars Battles. These custom blasters are modeled on the original weapons used by the characters in Star Wars. LEGO® Brick STAR WARS™ HOTH 8089 WAMPA CREATURE 100% LEGO minifigure + Bones! WAMPA CREATURE! All Wampa Parts still sealed in factory polybag! Expand your STAR WARS forces and may the force be with you! 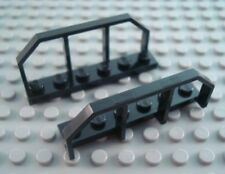 Each set may contain smaller platforms, bricks and specialty parts. Stuff Happens! ALL OF MY LEGOS ARE REAL! 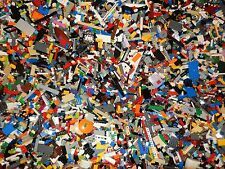 You will receive 25 LEGO minifig accessory PARTS from this huge pile, all in EXCELLENT, CONDITION! I will not fill request orders, as these are picked randomly by my kids. Appears in Set(s): #75059. Adding to your Order?. What to make sure you get an specific item, but want to look a round and add to your order?. No problem! Extra Features: None. We want you to be 100% satisfied with your order. Emperor Palpatine in statuette form as a hologram - a must have addition to your imperial forces! Holographic Emperor Palpatine! Expand your STAR WARS LEGO forces and may the force be with you! Perfect for Star Wars and/or LEGO fans. The misprint is the mysterious silver print on the top of his head. 100% real lego. You get the 3 sets shown. They are new and sealed. REAL genuineone from the star wars Lego set. Not individually wrapped like photos shows. Price shown may not be correct. New parts and deals are always being added. Lego Star Wars Set 7155 TRADE FEDERATION AAT. Lego parts are used but in excellent condition. Also Includes ORIGINAL INSTRUCTIONS. This set is COMPLETE. LEGO 30384 Snowspeeder (mini) polybag from Star Wars 20 years anniversary series. WARNING: Choking hazard. Toy contains small parts and/or small balls. Not for children under 3 years. LEGO 30461 Podracer (mini) polybag from Star Wars 20 years anniversary series. WARNING: Choking hazard. Toy contains small parts and/or small balls. Not for children under 3 years. LEGO Star Wars BLUE SUPER BATTLE DROID - Set 7163 CLASSIC + RARE + MAGNET STAND! The Super Battle Droid is an advanced version of the standard B1 Battle Droid and stands taller than the other Star Wars droids. With their upgraded armor, they were known to destroy everything in their path, including other droids, to reach their quarry. This item is from a huge LEGO Stars Wars collection that a friend of mine put together. Box in excellent condition with very light wear on the corners from storage. Graphics are bright and vibrant! Darth Vader has bite marks from a dog in a few different places. No other bite marks on minifigs to note. For instance, many of the storm troopers have flesh or yellow colored heads with faces instead of the black blank often used and sold new. From Lego Sets! Coming with Even Better Coating Quality. Lego Star Wars Episode 3 Droid Gunship (7678) - 100% COMPLETE with Manual!! Contains 36 LEGO Pieces. You're already purchasing the item. Quality Products. Governor Pre Vizsla. These custom blasters are made from durable abs plastic for fun to add realism to your Star Wars Battles. These custom blasters are modeled on the original weapons used by the characters in Star Wars. You will receive everything that is included in the picture. Taken out from the new set and then re-sealed in a polybag. LEGO Star Wars MiniFigure - Darth Revan Polybag (Set 5002123) SEALED! Appears in Set(s): 5002123. 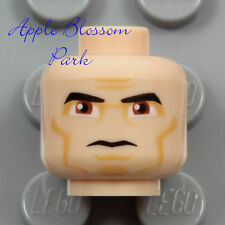 Minifig ID: 5002123. Adding to your Order?. What to make sure you get an specific item, but want to look a round and add to your order?. No problem! Extra Features: None. We want you to be 100% satisfied with your order. All real LEGO pieces taken from real LEGO sets. With 4 Lightsabers! GENERAL GRIEVOUS. (White armored version of Grievous). Expand your STAR WARS LEGO forces and may the force be with you! Perfect for Star Wars and/or LEGO fans. Tons of fun! Republic Attack Cruiser, Anakin Skywalkers Pod Racer, Republic Attack Shuttle, Seperatist Hover Tank and Rogue One U-Wing. Pearl Gray Handle and Tran-Blue detachable blade.